Jeff Minter unleashes another psychedelic shooting experience upon the unsuspecting PC gaming public with the release of Gridrunner Revolutions, with the original 1982 Commodore games available as unlockable extras. Gridrunner Revolutions is exactly what you'd expect from Jeff Minter. There are swirling colors, things to shoot at, and sheep that you must collect to advance. The game comes as a downloadable 4-level demo, and I've already played through said demo about five times in preparation for this post. One time was probably enough, but there's something extremely enjoyable about shooting spaceships while a high-pitched voice exclaims, "Sheepy!" Perhaps it is just me. Unlocking the full game will cost you $20, giving you access to countless levels and extras. 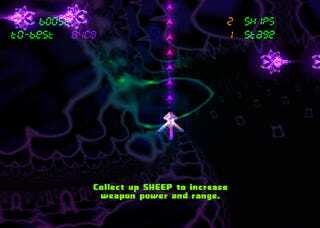 To get started, head over to the Llamasoft website and download 65 megs worth of shooty sheepy goodness.